You've got a new phone, now make it work hard for you. With every iPhone update there comes a flood of new iOS apps and upgrades. Some of them are essentials, some just show what the new iOS is capable of —and a very few are both. AppleInsider picks the ten most notable new or significantly updated apps. For yourself, there are apps that are more like essential tools that should be on your iPhone —and some of them already are. This week's highlighted apps, though, are all ones that are brilliant at demonstrating to others what the iPhone XR, XS and XS Max can do. These include updates to AirMeasure, Evernote, WaterMinder, Things, Citymapper, Drafts, PCalc, Halide Camera, Overcast and 1Password. Next time someone asks you why you spent so much money on a phone, show them this. Apple already provides a measuring tool in iOS 12 and you know how impressive that is, but it just looks like a line with a dot on it. Use this third-party alternative instead and whoever you're with will see a familiar tape-measure on the screen. Also unlike Apple's tool, this one can be used to measure buildings from a distance so you can settle arguments over whether your neighbor has exceeded planning permission or not. That works on the titles of notes regardless of which version of Evernote you have. 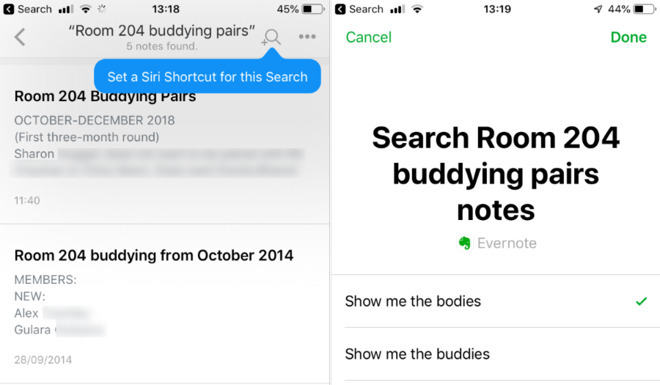 If you've got the paid Premium edition, though, the search also works on the contents of notes. This is a health app that tracks your water intake. It's already a very visual tool with each glass of water you have being shown as an amount of liquid filling up an outline body. Only, it used to be entirely dependent on you remembering to open the app and report what you've just drunk. 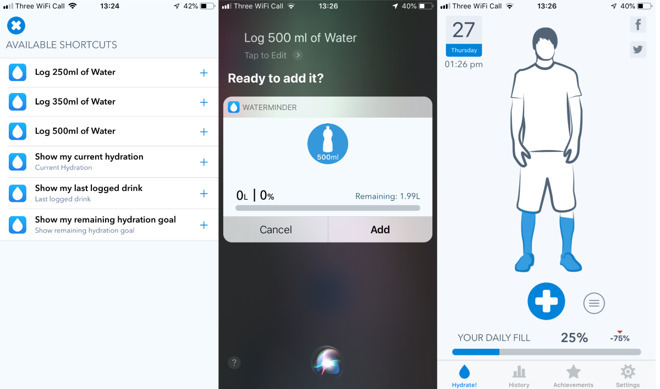 Now with iOS 12, WaterMinder comes with some pre-baked Siri Shortcuts so that you can tell Siri to "Log 500ml of water" and that will be entered into your daily intake. It's particularly smart at offering shortcuts that match the preferred measurement units you've set. All To Do apps have the problem that you don't always record your tasks in them. Things and rivals such as OmniFocus are predicated on making task entry so fast that you never put it off to later. For iOS 12, Things 3 has adopted Siri Shortcuts. 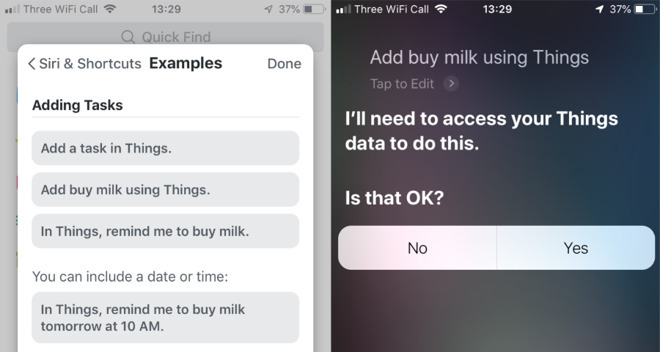 You've long been able to use Siri to add to Apple's Reminders app and then have Things automatically retrieve those tasks into its own database. It worked and we didn't complain, but now you can skip this workaround completely. Just tell Siri that you want to add a task to Things and say what it is. Similarly, you can now get Things to show you individual lists such as the one for your shopping, the one for your bridge building project. If you bump into Al in the street, you can tell Things to show you all the To Do tasks you've tagged as needing to be discussed with him. Get it for iOS: $9.99 for the iPhone version. The separate iPad version costs $19.99 and there's a Mac edition for $49.99 which has been updated for macOS Mojave. 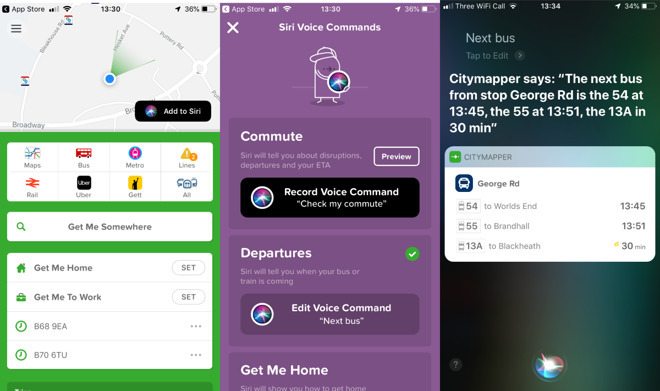 The very first Siri Shortcut we tried was saying "Next Bus" and having Citymapper tell us when that was, where the nearest bus stop is and the times of the next few departures. Citymapper is a transit app and if you set where your home and work locations are, you can then also ask it to detail today's journey to the office. Only, Citymapper does not cover every region. It's currently in 39 cities around the world so make sure you're also in one of them before you breezily ask it to "check my commute". Drafts is a plain-text editor whose chief benefit is how you can start writing the instant you open it: there's no creating a new document or naming one. Then if you go for the paid subscription version, you also get a second boon which is what are called Drafts Actions. You can automate sending your text out as an email, a Message or part of a much more complex workflow. Now with iOS 12, you can of course use Siri Shortcuts. 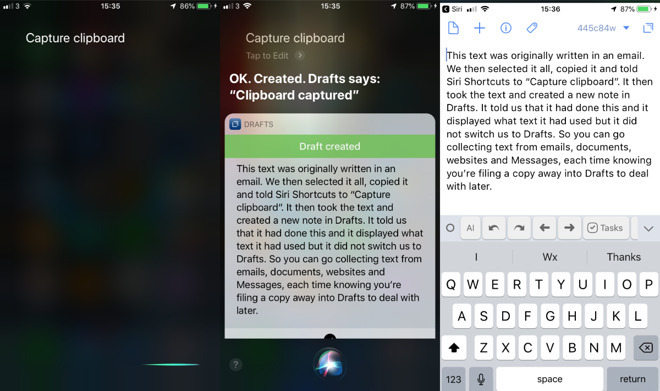 Even with the free version of Drafts, you can say "Capture clipboard" and the app will create a new note with the contents of the system clipboard. So if you're compiling information from a variety of places, you can select-and-copy it and then get Siri Shortcuts to file it away in Drafts. If you have the paid version with access to all of Drafts' Actions, then you can do more such as telling the app to start taking dictation. It's just a calculator yet for a decade or more, if you wanted to see new Apple technology in action, this has been the app to try. That's as well as it being a first-class calculator that features every science and math functions you can think of. It's even got one you might not have thought of: Reverse Polish Notation. Try that once on PCalc and you'll be hooked. Naturally, then, PCalc has adopted Siri Shortcuts but it has done so just remarkably, even astonishingly well. There isn't a single function in the entire app that you can't use in Siri Shortcuts —and while that's impressive, it's not what's superb. What's superb is how PCalc exploits Siri Shortcuts to the full and then works around issues Apple's software can't yet do. Siri Shortcuts is really only for issuing commands: you say something and an app gives you back a text, verbal or visual result. Apps can't ask you a question and listen for the answer, for instance. Say you're writing an email demanding money in US dollars and for some reason need to know what that is in Britain's pound Sterling. 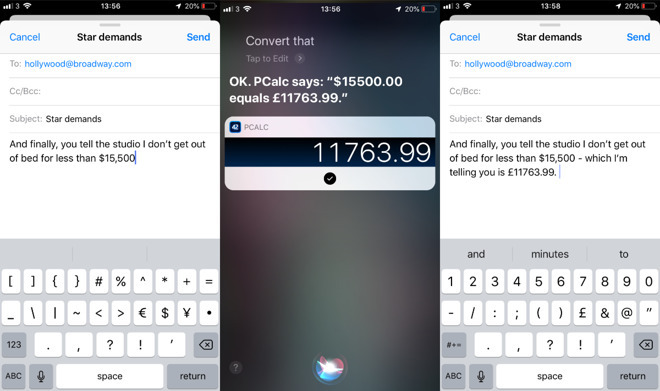 Write the dollar amount, select and copy it, then you can say something like "Convert that" —and PCalc will. If your friends are now weary of you talking to your phone and expecting them to be wowed by all that it can do, try them on something visual instead. 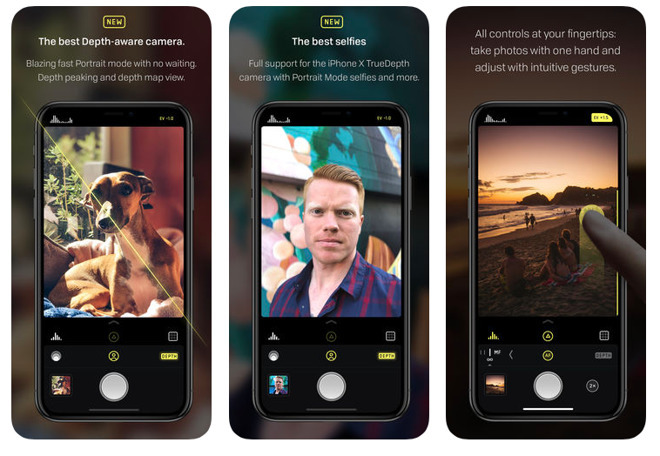 Halide Camera is an alternative to Apple's own photography app and it aims to bring professional tools to everyone. Consequently most of the clearest benefits of Halide will be visible just to you as you're composing a shot. That means you get fast switching between all of the options that your iPhone's camera lens is able to give you. And showing people the results you get from even a quick snap will at least intrigue them. To convert them into fellow Halide fans, swipe your finger across an image you've taken and show them how you can both quickly and finely make improvements. Or set your iPhone up on a tripod, walk away from it and casually call back "Hey, Siri, take the shot". Halide can instantly take a photograph when you do this with an iPhone XS. 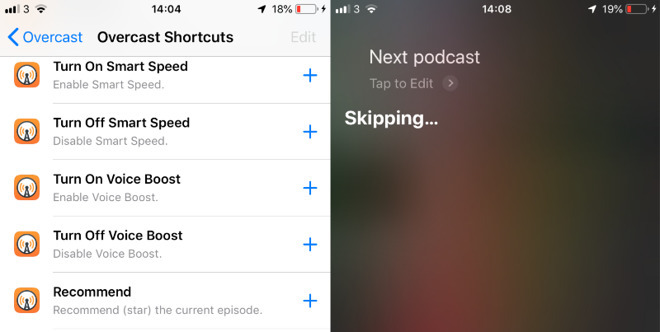 Apple's own Podcasts app is not the company's most popular software but it works and until now it's also had an advantage none of its rivals have. You can be driving and call out to Siri to play a certain podcast. Say its name and Apple's Podcasts will play it. No other podcast player was plugged into Siri like that —until now. Now Overcast gets that feature by how you can set up voice commands that only work within it. 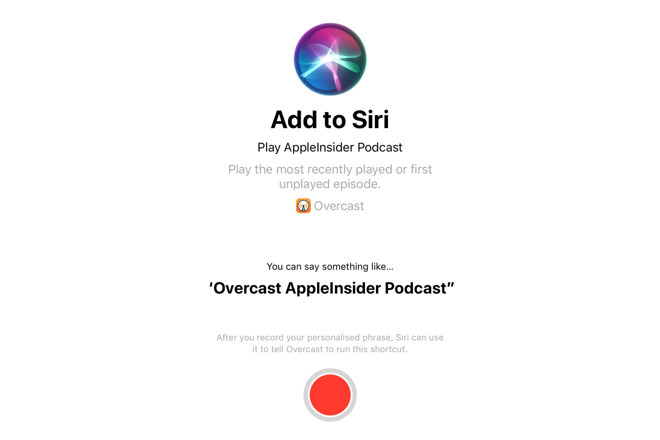 Tell Siri Shortcuts that when you say "Next Podcast" you want to involve Overcast's Skip feature and that's what you've got. It's provided quite a fine degree of control into Siri Shortcuts. So you can skip episodes, but you can also change the playback speed and turn an audio boost feature on or off. Possibly you shouldn't go around showing everyone this app but that's because as excellent as it is, it's entire job is to keep your passwords and credit card numbers safe. If you really trust these friends of yours, though, show them how AutoFill works. This is an iOS 12 feature that binds password managers such as 1Password into the system just a little bit more. Now if you are logging into a website or opening an app that requires a password, iOS 12 will offer you the option of entering one you've got stored in 1Password. Beyond how it plugs into iOS 12, the 1Password app now also keeps itself in sync with the 1Password service whether or not you open either of them. So long as you've signed in to the service in the app, you now know that your passwords are up to date regardless of when you changed any on, say, the iPad edition.